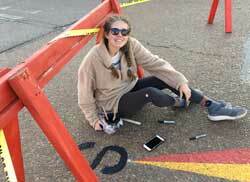 Chloe Johnson was one of the people working Thursday afternoon painting the compass rose on the pavement at the intersection of Carter and Main. Improving the appearance of the Carter Avenue access to downtown New Albany from I-22 has progressed significantly since fair weather ended what seemed like a winter-long rain. The New Albany Sustainability Committee (then known as the Beautification Committee) considered the proposal for the work at its July 9, 2018, meeting. During that meeting Sam Creekmore IV showed drawings and described proposed work at the intersection of Main Street and Carter Avenue, the designated downtown New Albany exit from I-22. Creekmore proposed a tree garden at the southeast corner of the intersection and a compass rose to be painted in color on the pavement. Anna Stroud worked Thursday on the compass rose which is part of the improvement to the intersection of Carter and Main. Work to construct the tree garden started earlier this week and painting of the compass rose is underway. 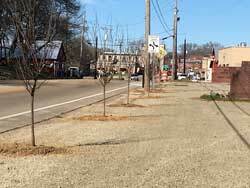 Last week redbud trees were planted along much of the length of Carter from the Interstate to downtown. Plans for making the main entrance to downtown New Albany more attractive started more than four years ago. 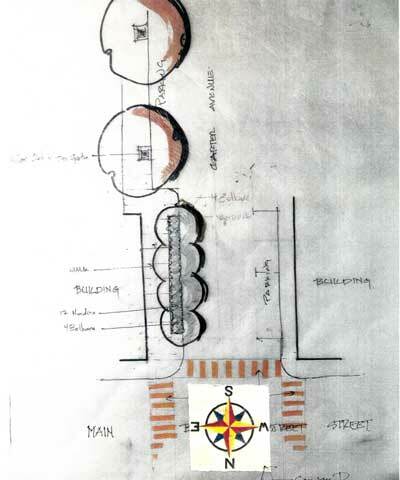 At that time an open storm sewer, about 500 feet in length, then flowed under and in full view of Carter Avenue, less than a hundred yards south of the intersection of Carter and Main. Recently planted redbud trees now line Carter Ave.
A $99,000 grant received in 2015 from the Mississippi Department of Wildlife, Fisheries and Parks helped finance replacing the open storm sewer with an underground culvert. That work was done in 2017. A bicycling path, which connects the Tanglefoot Trail to the Park-Along-The-River, now curves along the route of the former storm sewer and was also finished in 2017. Weather permitting, work on the new tree garden and compass rose is expected to be complete within the next several days.